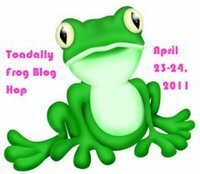 Ok, my Home Decor Hoppers and Toadally Frog Hoppers...read below!! Hi there my friends.... now this is going to be one confusing post and I don't mean to do it. I didn't know what to do. I decided that I'd combine my posts to one. Now to make it less confusing I'm going to put in bold which place to look for the instructions of your hop choice and I'm going to have them in different colors. I'm doing purple for the Decor Hoppers and I'm doing Green for my Froggie Hoppers. Hey what can I say I had to be partial to the Froggie's I had to give them their color. Froggie's you ready to jump with me???? OK... now if you've come from Janice our dear friend at Cricut Confessions you're on the right lily pad here. If you are just stopping by then my goodness you need to start hopping on the lily pads all the way back to our Leader Karel at One By One The Flamingo's Are Stealing My Sanity. Now here's my project for the Froggie Group. Now mind you I didn't make this little guy... well the live one I did, but the green one no. In fact a dear group of ladies where my Aunt who has now passed on attended church made them for the ones that were at home and couldn't come to church. My Aunt was the first to receive one. FROG = Fully Rely On God is what frog stands for. Now this little guy was signed by all the ladies there and they gave it to my Aunt. We sat it in her favorite chair and it watched her as she laid there in her hospice bed. She would always tell us remember "FROG"... I would answer yes, yes I do sweetie. She said she did too. Then one weekend my little one was there and said to his Great-Great Aunt in the sweetest voice "Aunt Betty when you go to be with JESUS I will take care of your frog for you and love him and feed him and pray with him. I will also play with him." She had tears in her eyes and looked at me ~ I said Aunt Betty isn't he the sweetest. I didn't know he was going to say that to you sweetie... that's from his heart. She took my hand and said "He's such a dear! Let him take care of my frog for me!" I told her I would let him. So here are the pictures of him with the little frog. We surprised him with this at Christmas because we wanted him to think that this gift came from his Great-Great Aunt Betty .... it actually did. We had it there for her service then we asked the group of ladies if we could do this for him as he promised Aunt Betty that he'd take care of her frog. They happily agreed. I was ever grateful for this. Now with that ending ... I will now send you on to our Adopted Grandma Audrey at Life is Beautiful. Ok my Home Decor Hoppers!! I hope you didn't mind hopping through the Froggie lily pads. I have something very special for you. I wanted to first share the froggie there above with my little one. 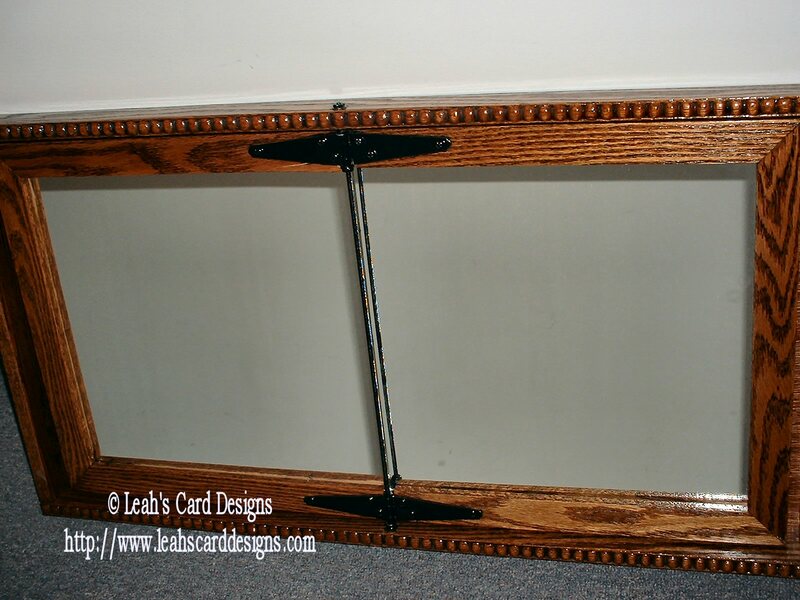 I then wanted to unveil the wonderful mirror that my Step Dad made for me for my Lighthouse Bathroom in our home. I love his work; it's so amazing and beautiful!!! (**I did ask his permission before posting this) I hope you really love seeing this as I am having it here in our home. I love the detail that went into this. Now mind you my copyright is on the mirror. I did that because everything on my site is under my personal copyright. I also did that to protect his work and he's been informed of this. I hope you enjoy it as much as we do as a family. I should say this picture was taken before we hung it up. Enjoy!!! Doesn't he do amazing work???? I just love it!!!!! In the middle there you see the rod that comes down; don't let that fool you into thinking why'd he put a rod like that. That's where the mirror basically folds ... you can pull it forward 1/2 at a time so you can see the back and sides of your hair. I love it!!!! I know I said that already... you should have seen me when he gave it to me.... I cried... I was in awe... I was at loss of words. I thanked him a million times... ok ok ... probably more than that.... I just love it!!! Now to keep up with all the hopping... you must now hop on to Jen R. at Memories of Jen. Thanks for stopping by. The wood and colors are beautiful. I would like to see it slightly folded. A intriguing idea. Love the frog & the story behind it. The mirror is great too. TFS! Happy Easter to you and yours Leah! Beautiful job, it is just awesome and I love it. Thanks so much for sharing and have a blessed Easter. Thank you for sharing your wonderful story of your aunt and your son. It was very uplifting! 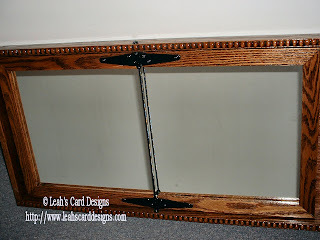 And what a gorgeous mirror! I wish I had someone that could make things like that for me!! Beautiful! The frog story is so cute and your step dad did a great job on the mirror. Awesome mirror frame I love the beeaded work--it matches the wood decorations on my 1897 Singer treadle cabinet. Thank you for sharing your FROG story! You are very blessed to have such a giving child, who seems to get it from his Mom!! Hope you had a Happy and Blessed Easter! What a sweet frog story. You have a very talented step dad! I'm sure you're proud of this piece and who wouldn't be? Thanks for sharing it. Great pics of your boy and his frog. I hope you are going to scrap them. Oh, hop over to my blog as I have something there for you Leah.